The Philippine Statistics Authority (PSA) releases its latest report today on the country’s official poverty statistics for the full year of 2015. The PSA report provides the estimates of poverty incidence using income data from the first and second visit of the Family Income and Expenditure Survey (FIES) conducted in July 2015 and January 2016, respectively. Poverty incidence among Filipinos1 in 2015 was estimated at 21.6 percent. During the same period in 2012, poverty incidence among Filipinos was recorded at 25.2 percent2. On the other hand, subsistence incidence among Filipinos, or the proportion of Filipinos whose incomes fall below the food threshold, was estimated at 8.1 percent in 2015. 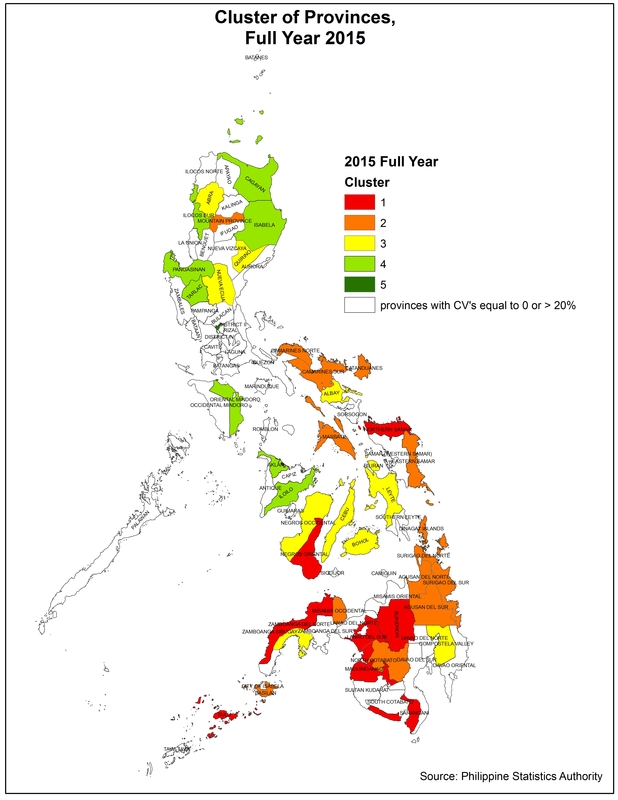 In 2012, the subsistence incidence among Filipinos is at 10.4 percent3 . Subsistence incidence among Filipinos is often referred to as the proportion of Filipinos in extreme or subsistence poverty. Food threshold is the minimum income required to meet basic food needs and satisfy the nutritional requirements set by the Food and Nutrition Research Institute (FNRI) to ensure that one remains economically and socially productive. It is used to measure extreme or subsistence poverty. Poverty threshold is a similar concept, expanded to include basic non-food needs such as clothing, housing, transportation, health, and education expenses. In 2015, a family of five needed at least PhP 6,329, on average, every month to meet the family’s basic food needs and at least PhP 9,064, on average, every month to meet both basic food and non-food needs. These amounts represent the monthly food threshold and monthly poverty threshold, respectively. They indicate increases of about 15 percent in food and poverty threshold from 2012 to 20154. PSA also releases statistics on poverty among families – a crucial social indicator that guides policy makers in their efforts to alleviate poverty. The poverty incidence among Filipino families based on the first and second visit of 2015 FIES was estimated at 16.5 percent in 2015. In 2012, the poverty incidence among Filipino families was estimated at 19.7 percent5. The subsistence incidence among Filipino families, or the proportion of Filipino families in extreme poverty, was estimated at 5.7 percent6 in 2015. In the same period in 2012, the proportion of families in extreme poverty was recorded at 7.5 percent. In 2015, on average, incomes of poor families were short by 24.6 percent of the poverty threshold. This means that on average, an additional monthly income of PhP 2,230 is needed by a poor family with five members in order to move out of poverty in 2015. 1 Poverty incidence among Filipinos is the proportion of people below the poverty line to the total population. 2 Based on the T-Test that was used to determine the statistical significance of the decrease in the poverty incidence among population at 90% level of significance, the results of the 2012 and 2015 Family Income and Expenditure Survey (FIES) indicate significant change from 2012 to 2015. 3 Based on the T-Test at 90% level of significance, the subsistence incidence among population from the results of the 2012 and 2015 FIES indicate significant change from 2012 to 2015. 4 Consumer Price Index (CPI) for Food for the Bottom 30% increased by 14% between 2012 and 2015. 5 Based on the T-Test that was used to determine the statistical significance of the decrease in the poverty incidence among families at 90% level, the results of the 2012 and 2015 FIES indicate significant change from 2012 to 2015. 6 Based on the T-Test at 90% level of significance, the subsistence incidence among families from the results of the 2012 and 2015 FIES indicate significant change from 2012 to 2015. See more on the Poverty Statistics main page.